"He's a man of peace in a savage land... Suburbia." 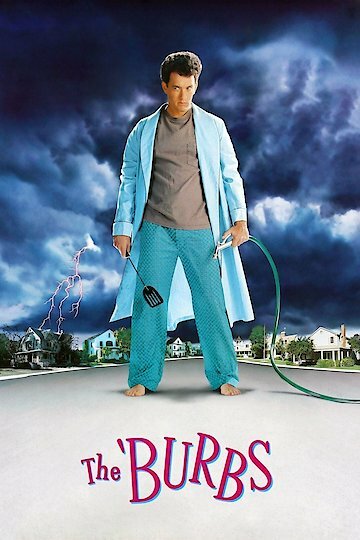 “The'Burbs” is a comedy cult favorite that was directed by Joe Dante and starred Tom Hanks as Ray Peterson, an average man in an average American suburban neighborhood. The film has an all-star ensemble cast that includes Bruce Dern, Carrie Fisher, Corey Feldman, comedian Rick Ducommun and Gayle Gordon. Ray Peterson lives comfortable with his wife and son in the heart of suburbia. He has an eccentric group of neighbors including a fussy widower Walter Seznik. When Ray takes a week off of work to do relax and do some household chores, he gets more than he bargained for. He spends some time relaxing in the yard with his friend Art and a neighborhood teenager, Ricky. The three witness a new bizarre family move into the house next door to the Petersons. The new neighbors turn out to be the Klopek family. There are three generations of very odd men who make a lot of noise at night and are very secretive. Ray and Art talk to another neighbor, war vet Lieutenant Mark Rumsfield about the Klopeks. Art and Rumsfield try to convince Ray that the Klopeks are up to no good. When Lt.Rumsfields wife, Bonnie, finds Walter’s dog running free on the street the group go to return the dog to Walter. When they arrive they find that Walter is missing and there are multiple signs of foul play. When Ray tells his wife, Carol, that he thinks that the Klopeks may have something to do with Walter’s disappearance, she thinks that he is just paranoid. Carol forces Ray to visit the Klopeks to welcome them to the neighborhood. While they are in the Klopek’s house, Art snoops around the back yard and finds Walter’s missing hair piece. When Carol leaves town to visit her family, Ray and Art sneak into the Klopek’s backyard and find what they believe to be a crematorium. They instantly think that the Klopeks are murderers. When they try to investigate further, they accidentally dig into a gas line and destroy the Klopek’s house in a huge explosion. The police arrive and notify them that Walter was found alive and move in to arrest Ray and Art. However, the Klopeks were indeed hiding a secret. “The 'Burbs” is a smart comedy that gained quite a cult following and helped propel Tom Hanks into several large projects. The 'Burbs is currently available to watch free on Popcornflix and stream, download, buy, rent on demand at Amazon Prime, Amazon, Vudu, iTunes, Google Play, YouTube VOD online.